Despite the Trump Administration's decision to tighten regulations on individual people-to-people travel and limit trade opportunities with certain Cuban entities, restoring diplomatic ties with Cuba and promoting engagement with the Cuban people remains popular. Yet the travel ban and trade embargo still exist, making Cuba the only country in the world that the U.S. government prevents its citizens from visiting. At NAFSA, we believe that travel is inherently educational and a human right. That is why over the past ten years we have continued to advocate for removing the policies that prohibit most U.S. citizens from legally traveling to and engaging with Cuba. Together with several other organizations, we celebrated a historic success with the opening of educational exchanges and academic travel to Cuba in 2011. 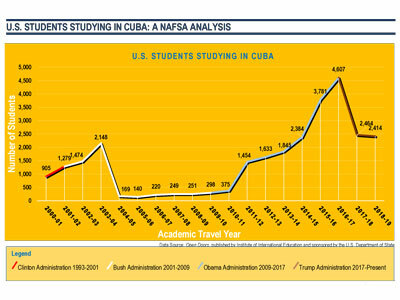 The number of Americans studying in Cuba (which declined by some 90 percent under previously imposed restrictions) is now on the rise. On December 17, 2014, the Obama administration announced historic changes to begin the process of normalizing relations with Cuba. However, the trade embargo and travel ban remain in place until the U.S. Congress acts. We urge Congress to do its part in normalizing relations with Cuba by ending the travel ban and lifting the trade embargo so that Americans can engage freely and constructively with Cuba and its people.